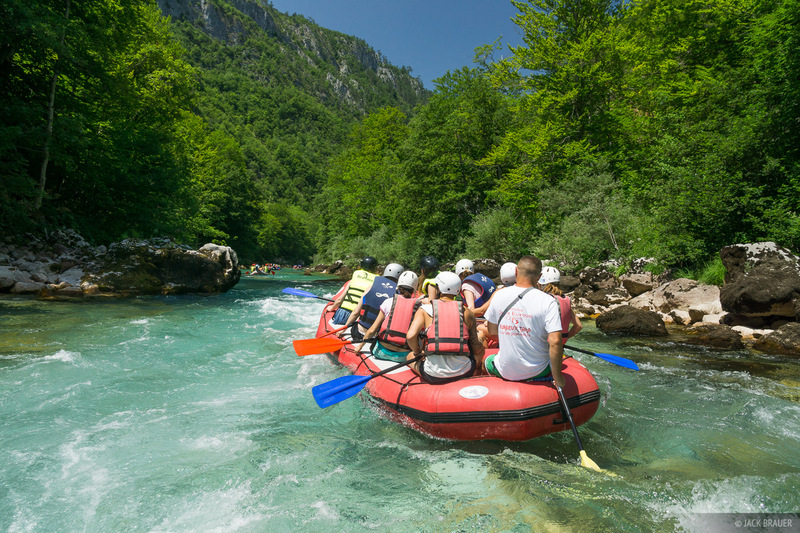 One of the highlights of a trip in Montenegro which is already full of highlights has been rafting down the Tara River. 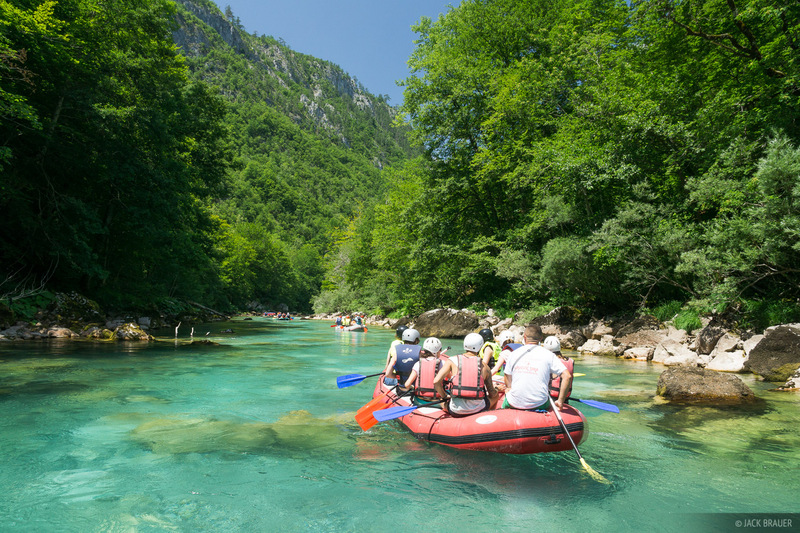 With its crystal clear turquoise spring-fed waters, the Tara is easily the most beautiful river I’ve ever seen. 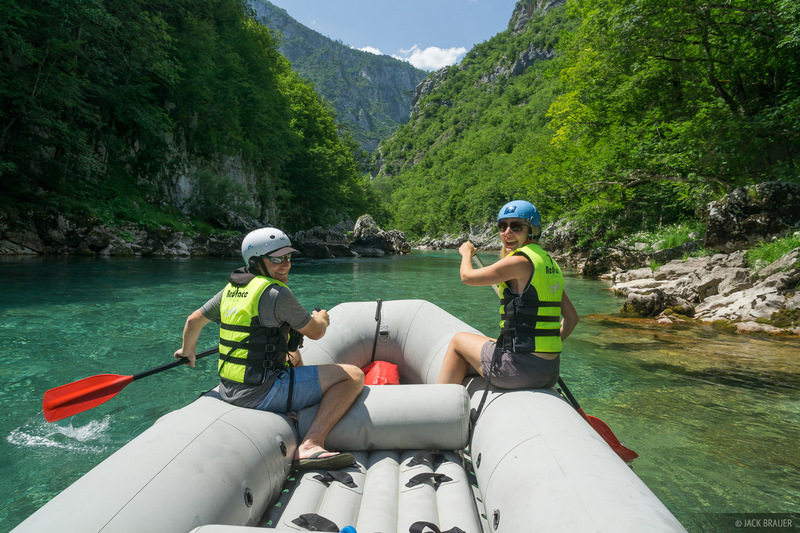 We joined a full day tour with one of several rafting outfits based out of the town of Zabljak. 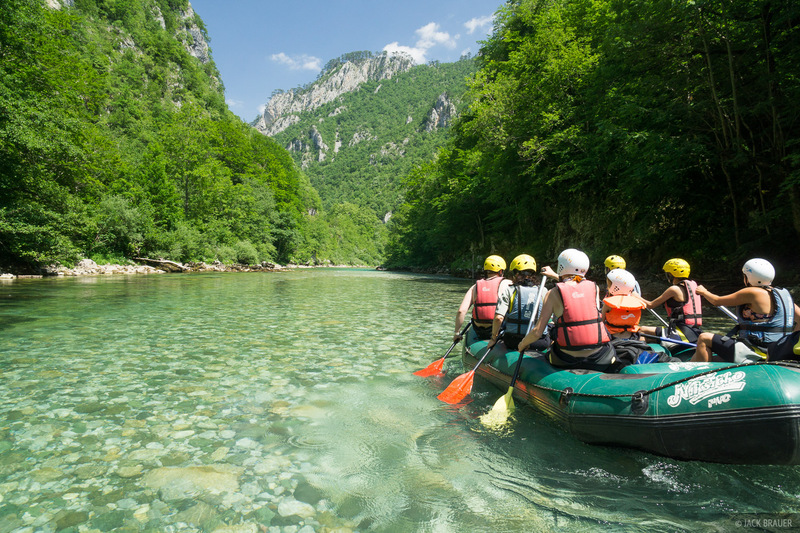 This is the most popular tourist activity in the region, so it was quite the production… The river itself is mostly mellow during the summer, with a few minor rapids but nothing too rowdy. Mostly a fun and relaxing day of floating and swimming and soaking in the beauty of this river and its canyon. 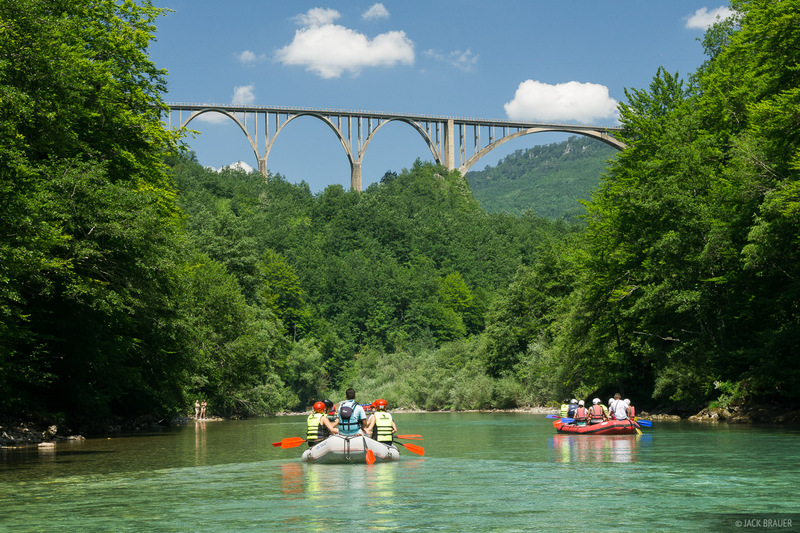 Rafting the Tara River in Montenegro, with the Tara Bridge above. The elegant spans of the 150m [~500 ft.] high Tara Bridge were completed just as WWII was starting. At the time it was the largest concrete arched vehicular bridge in Europe. Its 365m [~1200 ft.] length is carried on five sweeping arches, the largest of which is 116m wide. In May 1942, with large numbers of Italian and German troops stationed in Zabljak, the Partisan command gave the order to blow up the bridge. The honour went to one of its engineers, Lazar Jauković, who planted the bomb that destroyed his beautiful creation. Jauković was captured by the Italians and Cetniks (Serb royalists) and executed on the remains of his bridge. When it was rebuilt in 1946, Jauković’s bravery was acknowledged by a plaque that still stands by the bridge today. Most rafters join a half day tour, and for the first half of the day we shared a raft with a fun-loving family from Slovenia. After a midday break, the majority of people left and we continued down the river with just the two of us and our guide on the raft! There was only one other raft (with two other people) on this second stretch of river which went through an even deeper and more remote part of the canyon. 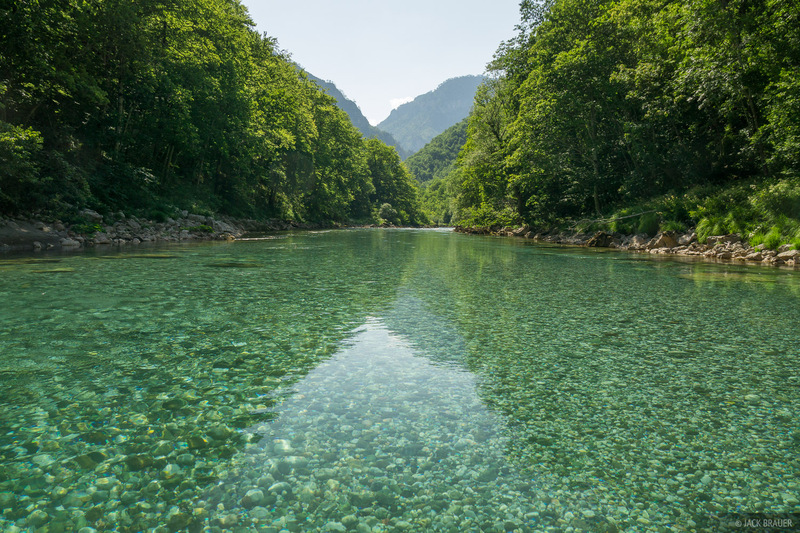 The beautiful Tara River in Montenegro. The river changes depths from only knee deep like here to over 15m deep in some spots. Because of the extreme clarity of the water, you could still see the bottom almost perfectly regardless of the depth! We saw quite a few large fish swimming down there along the way. 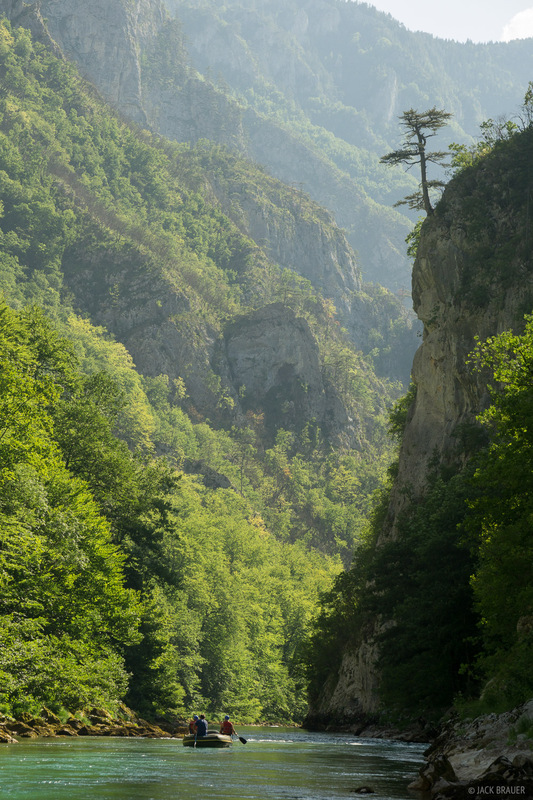 The Tara Canyon is the deepest canyon in Europe, 1300m (~4300 ft.) at its deepest point. We floated through 28km of it. What a day! Posted in Alps & Europe and tagged Montenegro.